Within a week of switching him to raw feeding, we saw an immediate change and realized the new diet was working. Today, more than two years after starting him on a raw food diet, all of his health issues are in the past. We have four dogs that are raw fed and their diet mainly includes raw meat, a base mix by The Honest Kitchen, and supplements. I choose to use base mixes, because it’s the easiest way to create a balanced diet that also includes vegetables, which I believe are important in our dogs’ nutrition. We get most of our dogs’ food through a local raw co-op, which is more than 50% less than ordering commercial raw meals for our dogs. All of our dogs are allergic to chicken. Rodrigo is also allergic to beef. Through our co-op, we’re able to get venison, elk, rabbit, duck, lamb, goat, pork, and green tripe. We’re also able to get healthier dog treats at a great price. I love bully sticks and tendons for the teeth cleaning benefits. Plus they buy me at least 20 minutes – I can clean a room, prepare meals for a couple of days, or watch a portion of a program. With our dogs, I will only allow these chews once or twice a week, due to Rodrigo’s protein allergies and the smell. If you’re sensitive to strong smelling treats, I’d recommend the tendons, which don’t have a smell when compared to the much beloved (by our dogs) bully sticks. Pork ears and hooves are very popular with our dogs. The ears are less smelly than the hooves; the odor the hooves produce slowly builds and knocks you in the face, so don’t let your dog hide them in the house. Yuck! We limit the pork ears, because if given in large quantities, they can lead to loose stool and diarrhea. 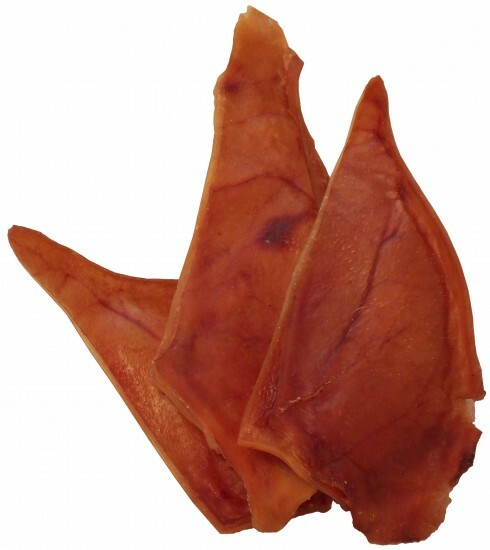 The Pig Ears from Jones Natural Chews are a single ingredient, USA grown, slow baked treat that dogs love. We feed our dogs duck necks, turkey necks and lamb necks. Duck and chicken backs are other options for dogs, but we stick with the necks. Because the bones are raw, I prefer our dogs to eat them outside. Some raw feeders use tarps indoors; we’re still training our dogs to stick to their tarp when eating bones indoors. Not fun. The bones provide teeth cleaning benefits for our dogs – keeping their teeth white and their jaws strong. Our dogs go nuts for fish skin treats, and I buy them by the case through our local raw food co-op. Fish skin treats aren’t always the best dog treats for dogs, because all the toxins in the ocean are stored in the fat and skin of the fish. When shopping for fish skin treats, buy from reputable brands that understand this and take proper care when sourcing their fish and fish skin. I give our dogs two duck feet each a couple days a week. Duck feet offer a natural source of glucosamine and chondroitin, which support joint health. I prefer smoked duck feet (which are cooked slowly on low heat to make them safe for our dogs to eat) to raw duck feet, because the raw ones are pretty gross to handle. I’m trying to get over that, because I can get them at a great price. There are many more options available for dog lovers who want to feed healthy dog treats. We are becoming savvier about our dog’s nutrition, and health and brands are providing better options for our dogs. For a complete list of the dog treats I feed to our dogs, check out The Ultimate Guide to Healthy Dog Treats I created earlier this year. As with many dog treats, we feed these to our dogs under supervision. Author: Kimberly Gauthier is a dog mom to four dogs and writes about raw feeding and dog nutrition on her blog Keep the Tail Wagging. 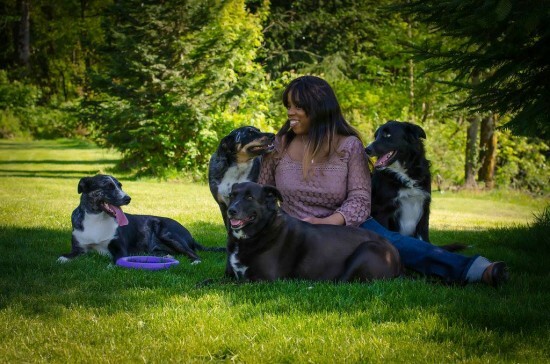 She recently published the book Raw Feeding from A to Z, which is a compilation of blog posts combined with easy recipes sharing her experience as a raw feeder. Visit Jones Natural Chews to see their line of all natural, grown and produced in the USA limited ingredient meat treats for dogs!